Hope everyone had a wonderful Thanksgiving! 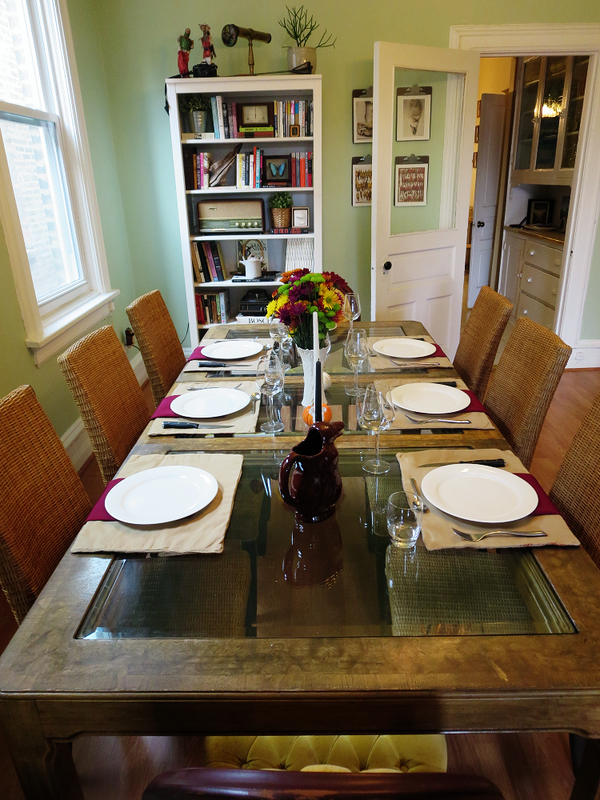 We hosted for the first time and we cooked with S's brother and our friends came over and brought delicious dishes as well. 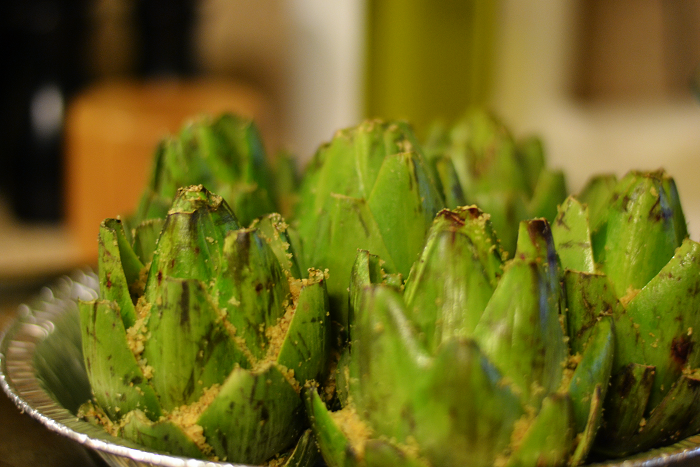 ↳My grandma's stuffed artichoke recipe. Of course, mine did not came out as good as hers. 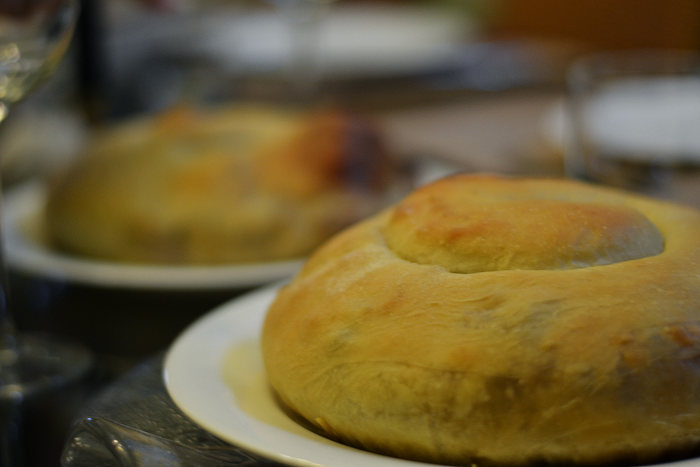 ↳My grandma's sausage bread recipe! I've made these a few times, so I've gotten good at them. When there's sausage, mozzarella, and Italian spices inside of a pizza dough, how can you go wrong? 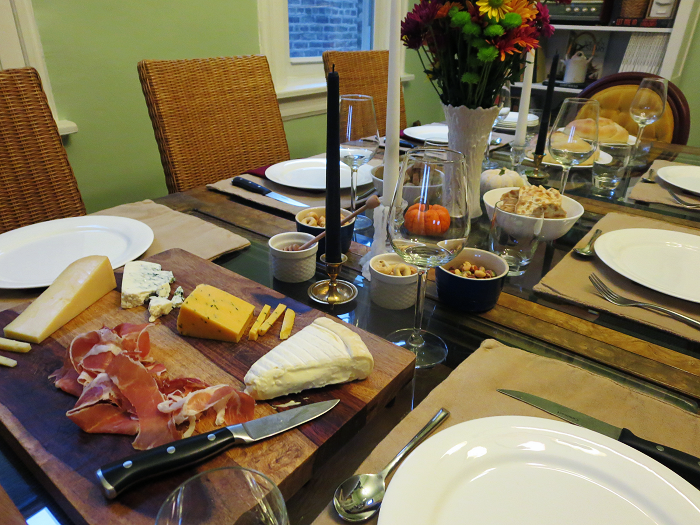 ↳We had some of our favorite cheese and prosciutto for appetizers as well. There was honey for the blue cheese, nuts for a little crunch, and taralli! My grandma always has taralli to snack on during holiday dinners, and they are little crunchy bread knots. I like the ones with fennel seeds in them because that's what she always had. ↳Our friends brought some delicious charcuterie! 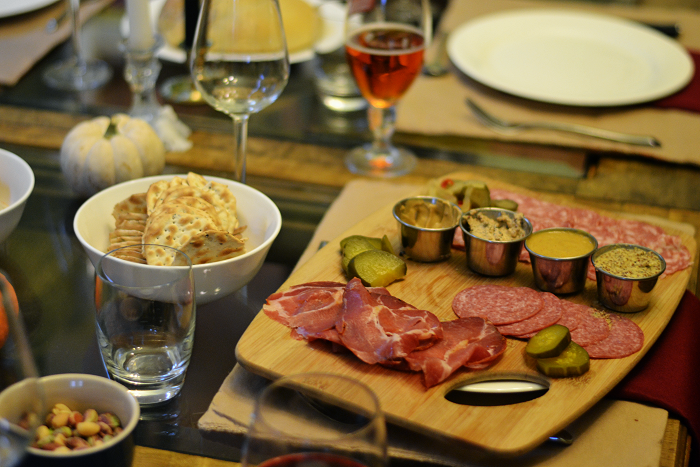 There was maple salami, capicola, soppressata, two kinds of pickles, and a variety of mustards, many made with beer! I could have a whole meal of meat, cheese, pickles, and whole grain mustard and be happy. ↳We had so many delicious things on the dinner menu. For starters, instead of roasting a turkey, we roasted some cornish hens, little individual servings. The rub I used was a porchetta/turkey combo that I found in the latest issue of Food and Wine magazine. I loved the rub! You can find the recipe here. 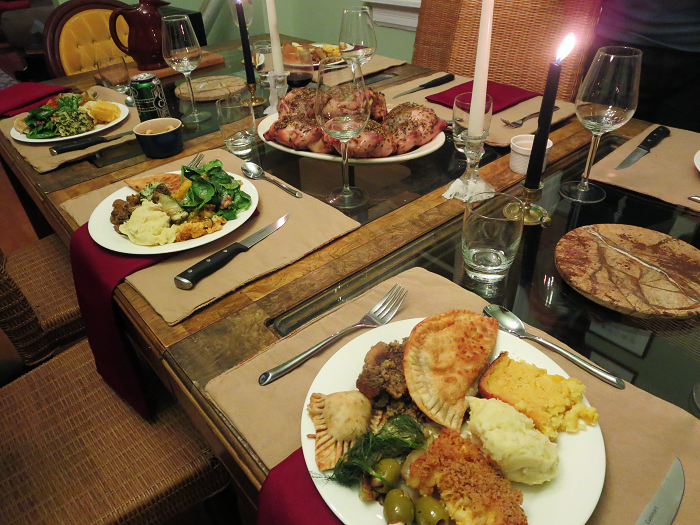 We also had my family's recipes for sausage stuffing, spooned cornbread, baked mac and cheese, and spinach and rice torte. 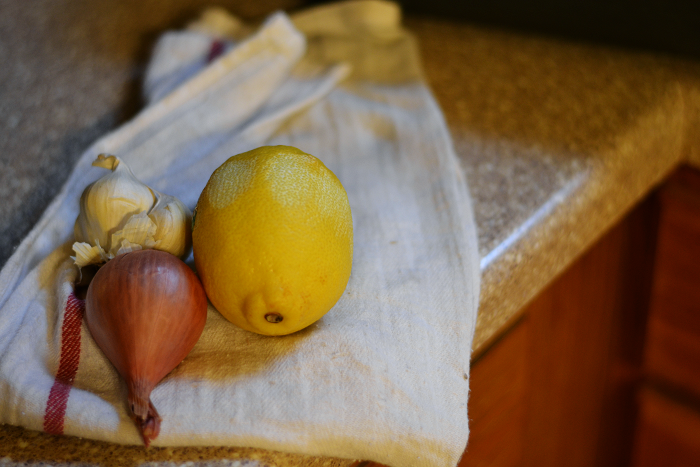 I make a goat cheese and nutmeg mashed potatoes, and our friends brought roasted fennel, and curry and squash empanadas! For dessert, I made vanilla bean biscotti dipped in chocolate with crushed pistachio on top. S made a blueberry and blackberry clafoutis, with a crumble topping for crunch - so yummy! 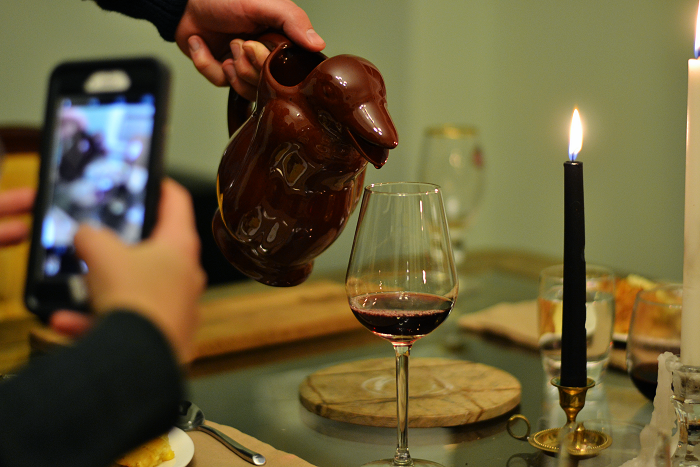 ↳And of course, we had our penguin wine pitcher. When we went to Buenos Aires, my dad requested that we bring him back a penguin wine pitcher. All of the parilla (meat buffet) restaurants in Argentina serve their red wine in a penguin decanter like this. Once we bought one for my dad, we started seeing them in all of the restaurants. We went back to the shop on one of the last days and had to bring one home for us too! Even though we this was the first Thanksgiving without family, it was still really great. Our friends that celebrated with us love food and spirits just like we do. I'm so thankful for my family and friends, for my dream job, for my city that feels so alive this time of year, for my brother in law visiting this week, for my friends that helped me host my first Thanksgiving, and for my home that keeps us close and safe. Although we weren't with our extended family like usual, this year I'm still feeling thankful for them, even if we're miles away.